Last month the controversial Cyber Intelligence Sharing and Protection Act (CISPA) was resurrected in the House by Reps. Mike Rogers (R-Mich.) and Dutch Ruppersberger (D-Md.). Following a closed-door meeting, the bill was voted out of the House Intelligence Committee Wednesday afternoon by a vote of 18-to-2 and privacy experts are up in arms over the lack of privacy protection that were stripped from the bill. Only two Democrats voted against the bi;;, Rep. Jan Schakowsky (D-IL) and Rep. Adam Schiff (D-CA). Where have we heard this before? FISA? The Patriot Act? (v) not delay or impede the flow of cyber threat information necessary to defend against or mitigate a cyber threat. It seems to me they are hoping that by making the section longer and more complicated, people will miss the fact that very little has changed. But what’s truly astonishing is that this new text reads like a confession that CISPA does involve all the stuff that they’ve been insisting it has nothing to do with. The big thing, of course, is that this oversight now involves civilian agencies, which is really the only meaningful change – and its impact has been rather minimized. Rather than putting the DHS or another agency in between the public and military agencies like the NSA, they’ve simply given them some input – and it’s hard to say how meaningful that input will be. Reports of significant data breaches make headlines ever more frequently, but lost in the cloak and dagger stories of cyberespionage is the impact proposed cybersecurity programs can have on privacy. The same Internet that terrorists, spies and criminals exploit for nefarious purposes is the same Internet we all use daily for intensely private but totally innocuous purposes. Here’s what needs to happen. First, source site CISPA needs to be amended to clarify that civilians are in charge of information collection for cybersecurity purposes, period. Anything short of that is a fundamental failure. Second, canadian generic cialis the bill needs to narrow the definition of what can be shared specifically to say that companies can only share information necessary to address cyberthreats after making reasonable efforts to strip personally identifiable information. Industry witnesses before the House Intelligence and Homeland Security committees testified this year that this is workable, and such information isn’t even necessary to combat cyberthreats. 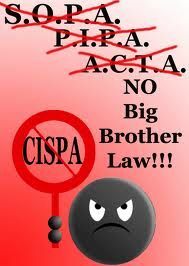 Third, after sharing, enter CISPA information should be used only by government and corporate actors for cybersecurity purposes. As a corollary to that, there should be strict and aggressive minimization procedures to protect any sensitive data that slips through. The ACLU and the Electronic Freedom Foundation (EFF) have banded together to Stop CISPA. The petitions with over 100,000 signatures has been delivered to the White House. Now we need to get to the phones. The White House switchboard is viagra generico 100 mg miglior prezzo pagamento online a Genova 202-456-1414. The comments line is source link 202-456-1111. The late internet activist Aaron Swartz called CISPA the “The Patriot Act of the Internet”. Call the White House and your representatives to protect your privacy rights. Check this out from CLG! This is sad! It leaves you to wonder how often and where this goes on. I, personally, have had some strange things happen on Yahoo when I’ve tried to send certain things and the e-mail just collapses in front of me. Trying it again, as I’ve done and the same thing happens. Makes you wonder, really!